The DeWalt DW788 Scroll Saw is one of the best. It comes with a double parallel-link arm design that cuts down on vibration and noise so you can make the most accurate and precise cuts possible. The tool free blade clamp is also great for when you have to make frequent blade changes. It takes only seconds. It comes with variable speeds that allow you to work with a wide range of materials, and the included dust blower allows you to keep dust and debris out of your line of cutting. This way, you make better cuts and don’t have to worry about mistakes. The arm design pivots from back to front, reducing your arm movements and delivering smooth, quiet operation. The arm lift it comes with allows you to work easily with the inner parts of your materials without having to hesitate. 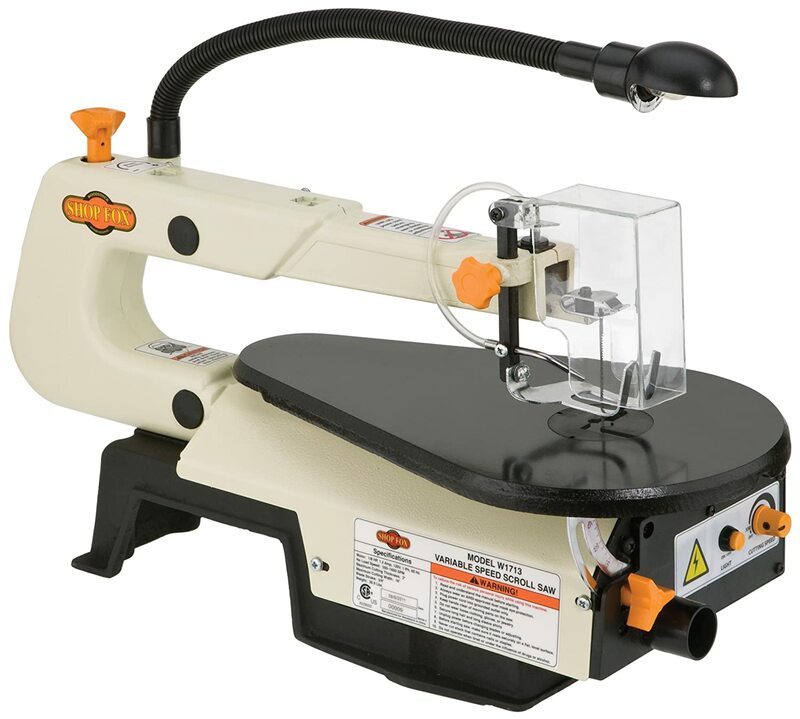 The Shop Fox W1713 is a 16 inch variable speed scroll saw that’s low enough in price to be worth considering. It’s the most affordable of the three scroll saws we have listed, and we think it’s well worth it. It includes a 1/8 horsepower motor, 16 inch cutting width, a gooseneck work light, dust blower, dust port, will work with plain or pin blades, and has a no load speed of 550 – 1700 Strokes Per Minute. The shipping weight is a surprisingly light 38 lbs, which makes for easy portability and travel to pretty much anywhere you want it to go. While it is one of the most expensive variable speed scroll saws on the market, many people think the quality of this saw is absolutely remarkable. 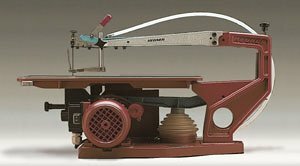 There are reports of people owning this saw for over 10 years and not having a single issue with it! For that kind of dependability, you should expect to pay substantially more for it than other models. It comes with a double quicklock tensioning system that keeps the blade tight and as true as it should be. And it stays that way even through the toughest of materials you can put it through. The motor is setup for variable speeds, and you’ll be amazed by the quality of your cuts. This is one scroll saw you won’t soon forget. The warranty is good for a full 7 years, which is way more than competing models. They put a lot of time and effort into this Hegner product, and the quality is simply astonishing. You can even buy a stand for it that’s sold separately on Amazon for a fair price. You can set a nickel on the edge of this saw and it’s so smooth that it doesn’t even vibrate off! Amazing!